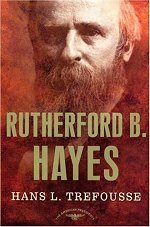 With the start of the Civil War, Rutherford Hayes left a life of leisure to accept a commission as a major in the 23rd Ohio Infantry. Hayes enjoyed the rugged military life and fought bravely, receiving four wounds in action during his service. In the fall of 1862, he led a charge in the Battle of South Mountain, Maryland. Despite receiving heavy losses in his unit and a musket wound himself, Hayes held his position. He was promoted to colonel and in 1863 his troops helped stop Morgan's raiders at Buffington, Ohio. During the Battle of Winchester, Virginia, 1864, his unit's flags were the first to enter the town. Later that year, Hayes was wounded for the fourth time in the Battle of Cedar Creek. After the battle, he was promoted to brevet brigadier general on the recommendation of General George C. Crook. In 1865, Hayes was elected to the House of Representatives without campaigning. He believed that any officer fit for duty, who at this crisis would abandon his post to electioneer for a seat in Congress, ought to be scalped. He was brevetted a major general of volunteers for gallant and distinguished services during the campaign of 1864 in West Virginia . 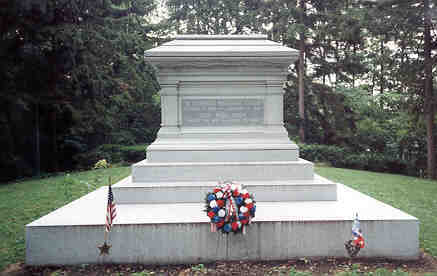 . . Rutherford Hayes became the 19th president of the United States in 1877. He looked back on his wartime service as “the best years of our lives. 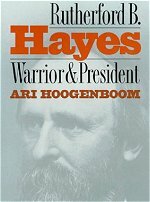 Beneficiary of the most fiercely disputed election in American history, 19th President of the United States (1877-1881), Rutherford B. Hayes brought to the Executive Mansion dignity, honesty, and moderate reform. 1861, April 1. "Union-saving avalanche" of Democrats and Know-Nothings unite to sweep Republicans out of local offices, including Hayes who loses his bid to be reelected City Solicitor. 1861, April 9. Hayes Vacates City Solicitor's office, forming law partnership with Leopold Markbreit. 1861, April 12. South Carolina forces fire on Fort Sumter. Civil War begins. 1861, April 15. President Lincoln calls for 75,000 volunteers. 1861, April 20. Hayes joins Burnet Rifles, a volunteer home company composed chiefly of Cincinnati Literary Club friends. They elect Hayes as their captain. 1861, May 15. Hayes and Kenyon friend Stanley Matthews try to secure commissions in an Ohio regiment. 1861, June 7. Governor William Dennison appoints Hayes to the rank of major in Twenty-Third Ohio Volunteer Infantry. Matthews made lieutenant colonel. They would serve under Colonel William J. Rosecrans. 23rd Ohio becomes the first three-year regiment organized in Ohio. It also is the first Ohio regiment in which the field officers were appointed by the governor instead of being elected by the troops. 1861, June 10 - July 24 Hayes and Twenty-Third train at Camp Chase in Columbus. Rosecrans promoted to Brigadier General and ordered into western Virginia. Eliakim Parker Scammon appointed new colonel. Hayes secures appointment of Dr. Joseph Webb, Lucy's brother, as regimental surgeon with rank of major. 1861, July 25. Hayes and 23rd depart for western Virginia to join Rosecrans' force. 1861, July 27. Regiment arrives in Clarksburg. 1861, July 28 - September 9. Hayes and 23rd march to Weston, Buckhannon, Beverly, French Creek, Sutton, and Summersville. 1861, September 10. Battle of Carnifex Ferry (WV). Union forces under Rosecrans defeat 2,600 Confederates under Gen. John B. Floyd. Hayes' first combat experience. 1861, September 19. Rosecrans appoints Hayes judge advocate of the Army of Western Virginia. 1861, October 24. Promoted to lieutenant colonel of the Twenty-Third and relieved of his duties as judge advocate. 1861, November 18 - 1862. Hayes and 23rd in winter quarters at Fayetteville. 1862, February 1 - March 3. Hayes' first military leave. Not having shaved since he had arrived in Virginia six months earlier, Hayes had a full beard. 1862, early March. Hayes and 23rd leave winter quarters at Fayetteville to begin spring campaign. 23rd attached to Gen. Jacob D. Cox's Second (Kanawha) Division. 1862, May 1. Battle of Clark's Hollow (WV). Capture of Princeton, WV. 1862, May 6 - 7. The Narrows and Giles Court House, VA. Capture of rebel prisoners and a large amount of stores. 1862, May 8 - 19. Confederates force 23rd to retreat to safety of Flat Top Mountain, WV. 1862, May 15 - 18. Battle of Princeton (WV). Confederates attack Federal advance field base at Princeton. Cox retakes the town. Hayes and 23rd pull back to Flat Top Mountain. 1862, June 1. 23rd receives "new" weapons, smoothbore muskets that had been rifled and altered from flintlock to percussion. 1862, July. Wishing to be a full colonel, Hayes attempts to get command of a new regiment, the 79th O.V.I. (to be recruited from Hamilton, Warren, and Clinton Counties in southwestern Ohio). Postpone's decision, hoping that rumors of Scammon's promotion to Brigadier General will come true. 1862, August 10. Destroys the Mercer, WV salt well. 1862, August 15. General John Pope orders 23rd to eastern Virginia. 1862, August 25. Hayes and 23rd arrive in Washington, DC after 10 days of marching and traveling by steam. 1862, August 27 - 30. Crossing the Potomac, the 23rd moves to Upton's Hill near Falls Church, VA missing the Battle of Second Bull Run, August 29 - 30, 1862. 1862, August 29. Ohio Governor David Tod appoints Hayes Colonel of 79th O.V.I. 1862, September 5. With the Confederates under Lee crossing the Potomac into Maryland, Cox's six Ohio regiments, including the 23rd, are pulled out of Virginia and assigned to Gen. Jesse L. Reno's Corps of Ambrose E. Burnside's army. 1862, September 6. Incident with Major General Jesse Reno involving men of the 23rd taking straw from wheat stacks for forage and bedding. 1862, September 12. Cox's division and 23rd retake Frederick, MD. 1862, September 13. Reno's Corps moves along National Road to Middletown, MD. 1862, September 14. Battle of South Mountain (MD). Gen. George McClellan orders Reno's corps to secure Turner's Gap in South Mountain. Reno calls on Cox's division; Cox places Scammon's brigade up front; Scammon picks Hayes and 23rd to spearhead the assault. During the attack, a musket ball strikes Hayes' left arm just above the elbow, fracturing but not splintering the bone, leaving a gaping hole, and bruising his ribs. Despite his wound he continues to give occasional commands. He is taken from the field to a field hospital where Dr. Joe Webb dresses the wound and then by ambulance to Middletown, MD. A local merchant, Jacob Rudy, and his family take Hayes into their home. The next morning, Hayes had telegrams sent to Lucy, his brother-in-law Will Platt, and John Herron. 1862, September 15 - October 5. Hayes recuperates at home of Jacob Rudy. While in Middletown, Cincinnati Commercial and several friends suggest Hayes run for Congress. Hayes refuses feeling compelled to stay in the army. 1862, September 17. Battle of Antietam (MD). 1862, September 18. Lucy learns that Hayes is wounded. 1862, September 23. Lucy arrives in Middletown, staying until October 5. Since her husband did not require constant attention, Lucy visits wounded daily (painting in hallway of Hayes home over fireplace). 1862, October 5. Hayes and Lucy leave for home via Baltimore, Harrisburg, Cleveland, Fremont, and Columbus. Before leaving Middletown, Hayes attempts to straighten out his status in the army. At the time of South Mountain, he had been discharged from the 23rd to take charge of the 79th O.V.I. He had not been mustered back into the army as colonel of his new regiment. With Scammon's promotion assured, Hayes declines the colonelcy of the 79th and asks to return to the 23rd. 1862, October 6 - November 29. Recuperating with his family in Ohio. 1862, October 15. Scammon's promotion to brigadier general allows Hayes to become colonel of the 23rd O.V.I. 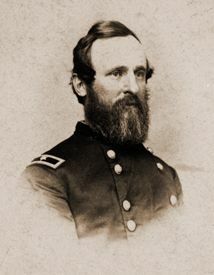 William McKinley, a commissary sergeant who coolly delivered rations while under fire at Antietam, is made second lieutenant. 1862, November 30. Hayes arrives at Camp Reynolds, WV, winter quarters of the 23rd Ohio. 1862, December 1 - 1863, March 14. Winter quarters at Camp Reynolds. 1863, January. Hayes becomes commander of First Brigade of the Second (Kanawha) Division (23rd Ohio, Fifth and Thirteenth Virginia, 3 companies of cavalry, and an artillery battery). 1863, January 24 - March 21. Lucy, Birch, and Webb visit Hayes at Camp Reynolds. 1863, March 15. Hayes and his command move downstream to his new headquarters at Camp White, opposite Charleston. 1863, June 15 - July 1. Lucy, her mother, and all the boys visit Hayes at Camp White. While visiting her husband, the Hayes' youngest child, Joseph Thompson, dies of dysentery, June 24, 1863. 1863, July 17 - 21. Pursuit of Confederate General John H. Morgan who had invaded Ohio with over 2,000 cavalry. 1863, July 19. Battle of Buffington Island (OH). Morgan's Raid. 1863, July 22. Hayes and 23rd return to Camp White where they stay until April, 1864. The job of Hayes' brigade is to prevent nearby rebels from sending reinforcements elsewhere. 1863, September 24 - October 21. Lucy visits her husband at Camp White. 1863, November 21 - 1864, mid-February. Lucy, her mother, Webb, and Rud join Hayes at Camp White, while Birch remains with Sardis in Fremont. 1863, December - January, 1864. Twenty-Third Ohio becomes the first Ohio regiment to enlist as veterans. Friends of Hayes ask if they can push for his promotion to brigadier general. Although flattered, he remarks, "A good colonel makes a good regiment." He "would rather be one of the good colonels than one of the poor generals." 1864, January. Confederates capture General Scammon who is held as a prisoner of war until August 1864. In February, General George Crook named the new commander of the Kanawha Division. 1864, mid-February - March 9. Hayes on furlough in Ohio resting and recruiting his regiment. 1864, March 10. Hayes and Lucy return to Camp White. 1864, April 29. Commencement of spring campaign. Crook's Army of West Virginia marches up the Kanawha. Crook's objective in May 1864 is to cut communications between Richmond and the southwest by destroying the Virginia and Tennessee Railroad bridge over the New River and the track toward Staunton. 1864, May 9. Battle of Cloyd's Mountain (VA). Twenty-Third led the assault. Hayes estimates the killed and wounded in his brigade at 250; the 23rd Ohio lost 123. There were 688 Union casualties altogether. 1864, May 10. New River Bridge (VA). Great Dublin Raid. 1864, May 11. Crook's army starts back to West Virginia. 1864, June 6. Buffalo Gap (VA). Crook's troops destroy the Virginia Central Railroad at Goshen. 1864, June 8. Crook's army enters Staunton, VA. At Staunton, Crook's army becomes a division of General David Hunter's Army of the Shenandoah and participates in his campaign to capture Lynchburg, VA.
1864, June 10 - 11. Capture of Lexington (VA). Hunter burns the Virginia Military Institute. 1864, June 14. Buchanan (VA). 1864, June 16. Otter Creek (VA). 1864, June 17 - 18. Lynchburg (VA). Failing to dislodge the Confederate defenders, Hunter hurries his army over the mountains to Charleston, WV. Hayes concludes that "a more active and enterprising commander than General Hunter", namely "General Crook, would have taken Lynchburg". 1864, June 21. Buford's Gap (VA). 1864, July 7. Jubal Early's invasion of Maryland results in the ordering of Crook's army, including Hayes and his brigade, East. 1864, July 17. Hayes and his brigade begin to look for Early. 1864, July 24. Battle of Winchester (Kernstown) (VA). Hayes' brigade takes the brunt of the Confederate assault. His stand at the stone wall saves Crook's army. 1864, August 7. Hayes learns that General Grant has relieved Hunter and appointed General Philip Sheridan commander of the Army of the Shenandoah. It consists of the VI and XIX Corps and VIII, or Crook's Corps (to which Hayes is attached) of about 7,000 men. Crook's corps also called the Army of West Virginia. 1864, late August. Republicans in Ohio's Second District nominate Hayes for Congress. He accepts the nomination, but refuses to leave his post to campaign saying, "An officer fit for duty who at this crisis would abandon his post to electioneer for a seat in Congress ought to be scalped." 1864, September 3. Battle of Berryville (VA). Fierce fight in which Hayes' "brigade had the severest fighting". 1864, September 19. Opequon Creek (VA). Hayes' decision to cross the slough at Red Bud Run insures a Union victory. Crook appoints Hayes to command the Second (Kanawha) Division in place of Col. Isaac H. Duval who had been seriously wounded. Included in the Union casualties is Hayes' adjutant general, Capt. Russell Hastings. His horse, Old Whitey, survives the battle (19 battles altogether) to become the mascot of the 23rd Ohio. 1864, September 22. Battle of Fisher's Hill VA. Hayes convinces Sheridan to drop his idea of a frontal assault against heavily fortified rebel positions. Instead, he assures Sheridan that his Kanawha Division, having climbed mountains for 3 years, could outflank the Confederates by climbing Little North Mountain. 1864, September 29. George Crook Hayes born in Chillicothe, OH. 1864, October 19. Battle of Cedar Creek (VA). Early surprises Sheridan's army, routing and inflicting heavy casualties on Crook's VIII Corps. Trying to rally his troops, Hayes' horse is killed throwing him to "the ground violently", injuring his ankle and knocking him out. Thinking that he had been killed, some of his men incorrectly report Hayes' death to the press. Regaining consciousness, Hayes eludes attacking Confederates by escaping into a nearby woods. Getting another horse, he "was also hit fairly in the head by a ball which had lost its force in getting (I suppose) through somebody else!" According to Hayes, "It gave me only a slight shock." Sheridan's appearance on the scene astride a huge galloping black charger waving his hat and shouting converts a sure Union defeat into a stunning victory. Cedar Creek was Hayes' last battle. Crook and Sheridan recommend his promotion to brigadier general. 1864, November 8. Hayes casts his vote for Lincoln along with Phil Sheridan, George Crook, and William McKinley. 1864, December 9. General Crook informs Hayes that he has been promoted to brigadier general. Commission dated October 19 "for gallant and meritorious services in the battles of Opequon, Fisher's Hill, and Cedar Creek". 1864, December 31. Second Division of Crook's army goes into winter quarters at Cumberland, MD. 1865, January 3. Hayes swears his oath of office as brigadier general of volunteers. 1865, January 10 - February 8. Hayes and Dr. Joe Webb on twenty-day leave to Ohio. Hayes spends time visiting family and friends and dealing with constituent matters as a congressman-elect. 1865, February 21. Confederate raid captures Generals Crook and Benjamin Franklin Kelley. Winfield S. Hancock appointed new commander of the Department of West Virginia. Hayes tries to secure Crook's parole and exchange. 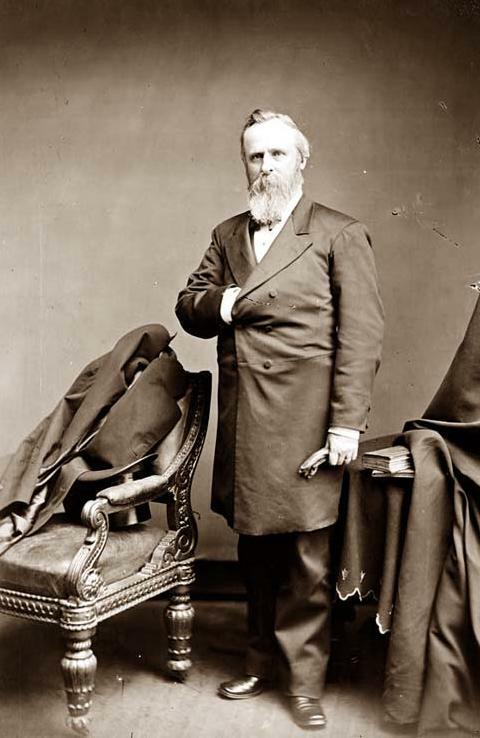 Failing to win Secretary of War Edwin M. Stanton's approval, Hayes appeals to Gen. Grant who arranges Crook's release. 1865, March 13. Brevet Major General "for gallant and distinguished service during the campaign of 1864 in West Virginia and particularly at the battles of Fisher's Hill and Cedar Creek, Virginia". 1865, early April. Hayes given command of the Second Brigade and ordered to take Lynchburg, VA.
1865, April 9. Robert E. Lee surrenders to Gen. Grant at Appomattox. The Lynchburg campaign becomes unnecessary. 1865, April 15. Hayes receives word of Lincoln's assassination. He heard the news as he was boarding a train at New Creek, WV, where he was stationed. 1865, April 26. 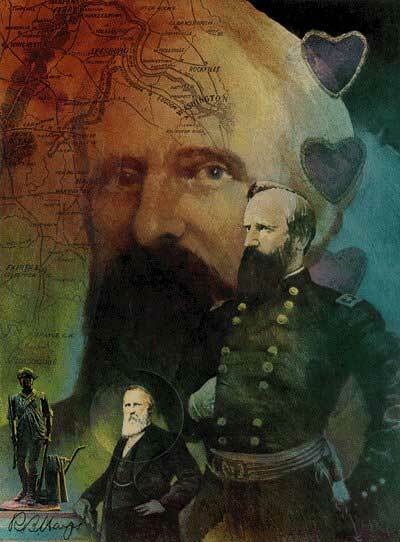 Hayes regards the surrender of Gen. Joseph E. Johnston to Gen. Sherman as the end of the war. 1865, early May. Hayes receives leave and visits Washington, DC. Talks to Ohio friends and governmental officials, including President Andrew Johnson. 1865, May 14. Returns to Ohio to bring Lucy back to New Creek. 1865, May 20. Hayes resigns as brigadier of volunteers. His resignation, which takes effect June 8, completes four years of service in the army. Arranges to have the 23rd's mascot, Old Whitey, shipped to Uncle Sardis in Fremont. 1865, May 22 - 24. Hayes and Lucy attend grand army reviews in Washington, DC sitting in the congressional stands. 1865, late May. With passes from Gen. Grant, Hayes and Lucy visit Richmond and Petersburg. After viewing "all of the awful desolation", they return to Chillicothe. 1865, June 8. Hayes mustered out of the army. 1865, July 26. Twenty-Third Ohio mustered out of military service in accordance with orders from the War Department.